Written By Embryo Digital on 29th November 2018 . EPDM rubber roofing has fast-become one of the most popular choices for flat roofing of all sizes, and with benefits including cost-effectiveness, durability and eco-friendliness, it’s not hard to see why. It’s estimated that over 1.3 billion square metres of the roof membrane has been installed worldwide, in climates as varied and extreme as the Middle East and Alaska due to its temperature-regulating properties. As it’s our flagship product, we wanted to discuss all its ins and outs and show you why it’s the best choice for your property. EPDM (Ethylene Propylene Diene Monomer) is a synthetic rubber made from oil, diene and the natural gas ethylene propylene that is vulcanised and turned into sheets of the roofing membrane. Vulcanisation strengthens the rubber, makes it weather-resistant and more rigid, and therefore more stretch-resistant. A double garage re-roof we installed in Steeton. What Benefits Do EPDM Rubber Roofing Offer? A life expectancy of approximately 50 years, due to its ability to stretch up to 300% before breaking. This is especially useful during intense summers and freezing winters, and protects the building from wind, rain, snow and hail as well. It’s even been proven to withstand temperatures as low as -30°C and as high as +120°C. One of the most environmentally-friendly roofing materials. The amount of energy needed during manufacturing is considerably less than other materials, and primers, adhesives and cleaners are typically added to the membrane to reduce any Volatile Organic Compounds (VOC) emissions. Post-industrial products can easily be recycled, as can the roof itself when it comes time to replace it. An attractive and sleek appearance and finish, complementing everything from slate and tiled roofs to green roofs and those made of metal. Easy to fit, as usually installed as whole sheets to ensure the whole roof is covered, limiting seams. 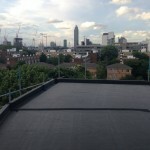 EPDM rubber roofing we installed on a new build block of flats in London. Why You Should Pick Alvadac For Your EPDM Rubber Roof? Over 40 years’ experience in supplying and installing a range of flat roofing systems and EPDM rubber roofs for buildings as versatile as art galleries, electricity substations, homes and extensions. A dedication to providing excellent customer service to all of our clients, giving them the best product at the most competitive prices. Our 9.90 Checkatrade score highlights this. We have thousands of metres in stock ready for collection and installation, so can offer a quick and efficient service. We offer a 20 Year Guarantee, providing peace of mind in the unlikely event you experience any issues during this time. 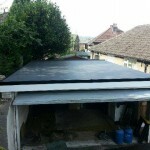 Thinking about an EPDM rubber roof for your property? Please contact us today for a free no-obligation survey and quote. To also see some of our work, please click here. Written By Embryo Digital on 27th February 2017 . What type of roofing does your roof need? If you don’t know, we have compiled a brief list of information on each type of roofing we offer to you. Call us today to find out how we can help you with your roofing solution.